This is a beautiful brow freckled yearling with big capacity, that has maintained really good weight while growing a huge ram lamb. True to her EBVs, she has thrown a good grower that was well-fed with great milk. She meets the criteria for the NSIP Certified Maternal designation, due to being in the top 50% for the index, and top 30% for NLB and MWWT. Her sire is from Iowa, dam is one of Mary Bakko’s (Misty River Farm) last ewes, and one of her highest scoring ones, sold off when she retired in 2016. EBVs from the 2018 lamb crop 60 day weight data. Photo taken in July, pictured here with her lamb. 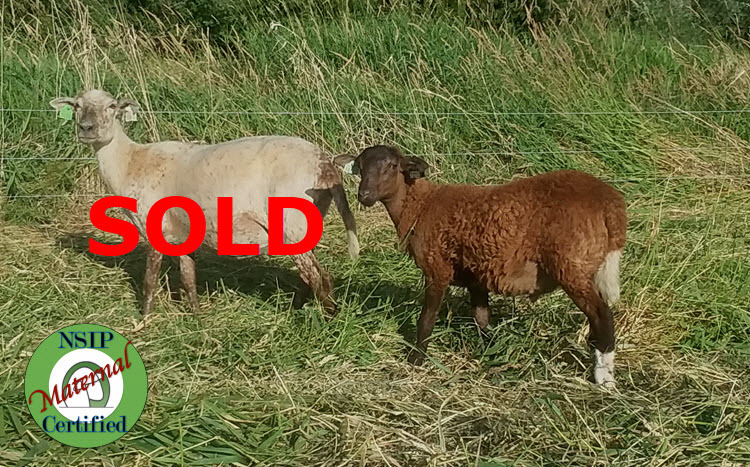 Her chocolate ram lamb (18102) will be weaned mid-August, or she can go with him at side sooner (for an extra fee). Lambing history starting as a yearling: 1/1.